After taking a long elevator ride, zigzagging through hallways and climbing ladder after ladder, we were finally there: on the roof of the Joseph Smith Memorial Building, overlooking all of downtown Salt Lake City. I knew my job with DWR would provide me some cool opportunities, but never could I have guessed I’d end up on top of one of the tallest buildings in Salt Lake, holding a box with a peregrine falcon inside. 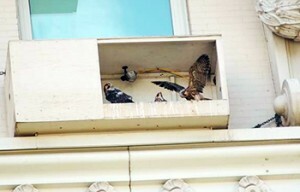 Here’s a look into the downtown falcon nest box just before 2012’s kids fledged. Let me explain how that happened. I first learned about Salt Lake’s famous peregrine falcon pair last spring. Year after year, since the 1980s, falcons use a nest box found near the top of the Joseph Smith Memorial Building in Temple Square. The LDS church has been kind enough to set up webcams in the nest, so it’s become a downtown tradition to watch the lives of these birds and their young. Bob Walters, Watchable Wildlife Coordinator for DWR, leads a team of volunteers at the end of June and into July, as the peregrine chicks in this nest box start testing their wings. Because of the nest’s tricky placement among skyscrapers, asphalt and busy city traffic, it’s a difficult place to learn to fly. The group of bird-loving helpers, dubbed the Salt Lake City Watchpost/Rescue Team, stands by — walkie talkies in hand — ready to rescue the young birds after they’ve worked up the courage to leave the nest box. Boxer Sue, just before one of her rooftop releases at Temple Square. I jumped at the opportunity to be part of this team. Why? Well, first, I love peregrines. They are the world’s fastest bird. We’re lucky that Utah is home to these powerful, elusive birds of prey. Second, I thought it’d be a great opportunity to mingle in the community and enjoy the outdoors. I was right about that. Because of my work schedule and where I live, I wasn’t able to visit Temple Square to help keep an eye on the young chicks very often, but thank goodness I showed up when I did. I had just heard sad news about one of the chicks. Macy, the second bird to leave the nest, crashed bill-first into the Key Bank building and didn’t survive. That left only two surviving chicks from the brood, and one of them, Boxer Sue, was with a rehabilitator from her own crash-related injuries. My Sunday schedule was clear, so I headed to Temple Square. I wasn’t sure if there would be much bird action that day, with only Primo out and about. (We called him Primo because he was the first to leave the box.) But I showed up anyway. Just as I arrived to the site, so did Boxer Sue — the injured peregrine chick that was observed overnight at the rehabber’s. Steve, one of the dedicated volunteers on the Watchpost/Rescue Team, had just picked her up. X-rays showed that she was healthy and ready to give the flying thing another shot. Out of a medium-sized cardboard box appeared this glorious, young bird, right in front of my eyes. She still had a few tufts of fluffy, white down poking up through her tough, dark exterior feathers. When she was properly restrained, I was able to touch the top of her head. Primo, one of last year’s young peregrines, decided to go shopping at City Creek. This photo was taken just after we scooped him up and took him to safety. I had a smile plastered to my face as I watched Bob and Steve work together to band Boxer Sue. This is not your typical backyard songbird and definitely not one you’d ever expect to be able to touch. “Do you even have to ask?” I replied, springing forward to grab the container holding Boxer Sue. And that’s how I ended up on that roof. What an amazing experience it was. Her release went well. 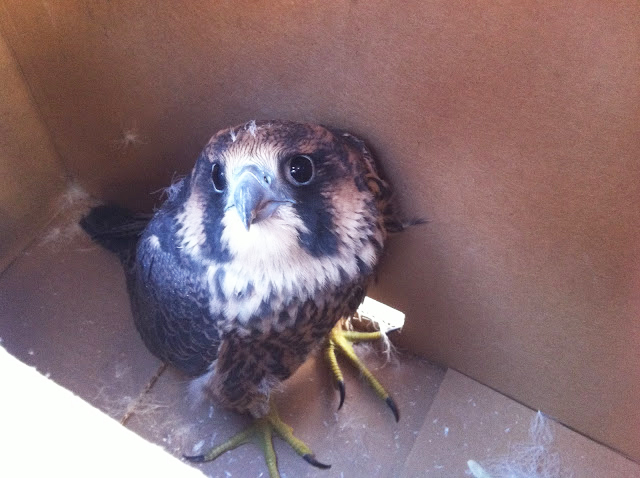 She actually turned out to be the only falcon kid from 2012’s brood that didn’t have serious injuries. I was proud to have the chance to be part of helping her thrive in the dangerous city setting. Last year’s falcons kept the Watchpost/Rescue Team on their toes. At one point, Bob and the team chased a bird into a City Creek clothing store. Apparently peregrines shop too? Members of the rescue team have stayed out until wee hours keeping an eye on peregrines in potentially dangerous situations. 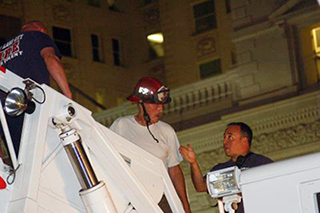 Bob’s even had the chance to use a firetruck ladder to reach a bird after a crash-landing in a hard-to-reach spot! Bob receives instruction on how to use the fire engine’s ladder so that he can rescue a young peregrine in a sticky situation. 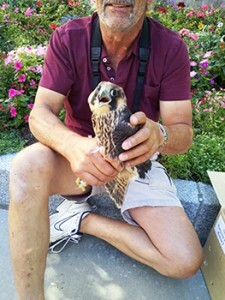 I love seeing the community’s involvement with the peregrine falcons. From firefighters lending us their ladder, to building managers giving us access to rooftops, it’s great to see everyone come together for the birds. Our feathered friends make sure there’s never a dull moment. It’s a lot of fun to see the birds in person after having watched their antics online all spring. You get to know them through the webcam, then by signing up to volunteer, you get a chance to actually meet them (and possibly handle them!). Contact Bob if you have questions or if you want to sign up to volunteer. Call him at 801-209-5326. The falcons and I look forward to seeing you out there this summer! Current status of the 2013 nesting season: There are currently four eggs in the nest box downtown. We expect them to start hatching around May 20. Watch the birds in high definition! You can also receive up-to-date news on the SLC peregrine falcon Facebook page. 5/22/13: THE FIRST PEREGRINE EGG HAS HATCHED!! Baby is chirping and breathing. Mom/dad keeps tucking under her/his chest so I’ve only had a quick peak. One day I’ll be able to tell mom/dad apart! Good luck lil fellas! The tag draw was an extreme upset for many avid hunters. Not sure what the reasoning is behind it, but as for this huntress 8 bonus points and no tag is quite ridiculous. Anyone else feeling the strain of this?